Digital technology offers developing countries the opportunity to leapfrog development challenges. Photo credit: Eric Sales/ADB. 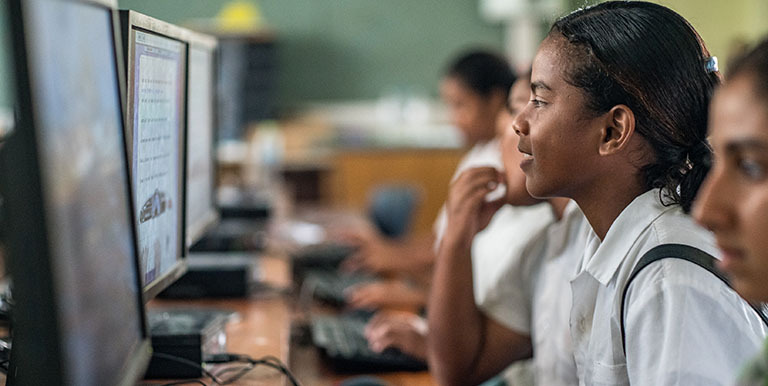 Digital change poses transformative opportunities, as well as risks, in capturing and interpreting data in support of sustainable development goals. Frontier technologies—robotics and artificial intelligence, internet of things, and 3-D printing—are not only transforming how our homes, factories, farms, cities, and nations are functioning, but also unleashing a tsunami of data, in volume, frequency and type. As of the beginning of 2018, social media management firms such as We Are Social, estimate that more than half (53%) of the world’s population of 7.6 billion people had access to the internet; three quarters of these internet users (corresponding to about 3.2 billion people) are active social media users; with 9 in 10 of those social media users accessing their chosen platforms through mobile devices. In a speech before the World Economic Forum in 2000, Former UK Prime Minister Tony Blair pointed out that “information replaces oil as the most important commodity." Central to the increasing use of new, emerging, innovative technologies, especially the internet, social media, and sensors, is the production of big data, especially digital footprints among technology users, often as an unintended consequence of technology use. With every tweet, like, comment, photograph posted on social media platforms, every movie or tv show watched, every email or SMS sent, every financial transaction made in the internet or other digital devices, people are giving information about themselves. Many businesses that own or access such infobases are transforming this new oil, volumes of data collages, into valuable insights and even monetizing them. A few years before countries across the world committed to attaining the Sustainable Development Goals (SDGs) by 2030, the United Nations convened a High-Level Panel of Eminent Persons on the Post-2015 Development Agenda. The High-Level Panel took note that new, emerging, frontier technologies are unleashing a data revolution that could be harnessed for sustainable development. This data revolution is allowing governments, private firms, researchers, and citizens to monitor progress in the SDGs and drive action, often with near real-time, granular data. Unlike the common perception of “revolution” as being quick, the data revolution is country context-specific: in advanced economies, the revolution may already be considered phenomenal and transformational. In several developing countries, especially least developed countries and small island developing states, however, technological adoption may be weak, thus harnessing the benefits of the data revolution may be far from the capacity even of those in national statistics offices (NSOs) and other data producers responsible for data collection, dissemination, and analysis of traditional data sources. Enabling countries that are not at the frontier to leapfrog and use new technologies, methods, and data sources is challenging without adequate people, institutions, and enabling environments (including statistical infrastructure). While emerging technologies can assist in the attainment of many SDGs with the creation of new products and services that increase prosperity, help us achieve food security, improve health care, and support us to care better for the planet, the differences in capacity to capitalize on the use of technologies and the concomitant increase in digital data have also raised challenges to promoting inclusive growth and equitable development. Several segments of the populations across economies feel left behind with their experience of volatility/vulnerability, uncertainty, complexity and ambiguity. Aside from increasing inequality of wealth and income, unintended consequences of technological progress also include erosion of personal privacy, as well as increased risks of cybersecurity, including data fraud. Further, some firms and governments, may be hoarding and storing this new oil into silos, rather than making data open for examination by everyone. Data, like technology, is neutral, but it can be used for good. Governments, civil society, private companies, and citizens are leveraging the power of data to create social good. Google, for instance, has collected various remote sensing data into its Google Earth program, allowing users to see cities and landscapes from various angles. Various partnerships are being undertaken for harnessing innovative data sources to either fill in data gaps or complement statistics generated from traditional data sources. Crowdsourcing exercises are being employed for the collection and analysis of data for disaster risk management and data on climate change. Citizen-generated data are also being used to monitor the needs and progress of vulnerable groups. Fundamentally, data for social good starts with open data principles, that is, having data that are freely available online for anyone to use and republish for any purpose. Further, to maximize insights, it is important to have data interoperability, the ability to access and process data assets from multiple sources and multiple formats without losing meaning and then integrate these assets into coherent information products or services (e.g., for mapping, visualization, and other forms of analysis). Many governments have long recognized the need for data and statistics to inform policy and effect development outcomes. In the fight to reduce poverty, for instance, decision makers require development data and statistics not only for the formulation of public policies and programs, but also for social protection targeting, and for the monitoring and evaluation of interventions meant to help needy and vulnerable segments of society. For many developing countries, even those with relatively good statistical systems, the demand for data has been expanding, out of a need to evaluate national development plans and progress in attaining the SDGs. But while many governments, whether in developing or advanced economies, want to reap investments from data, they are not necessarily prioritizing investments in statistical capacity development. Before the global goals were finalized, official statisticians, including those from Asia and the Pacific, suggested that statistics development become one of the SDGs. Although this proposal did not come to fruition, several targets and indicators of Goal 17 of the SDGs (on partnerships) pertain to statistical legislation, national statistical plans, and funds to strengthen statistical capacity. NSOs and data producers will need not only to focus on the production of statistics, but also on effectively communicating and increasing capacities among data users on the use of data for development. From 22 to 24 October 2018, over 2,000 participants from more than 100 countries gathered in Dubai for the Second World Data Forum to converse and think together about the evolving data landscape. Throughout the 85 sessions of the 3-day, biennial forum, representatives of NSOs, international organizations, and civil society organizations, as well as data scientists from the private sector and academia discussed data issues on six main themes. The forum concluded with the Dubai Declaration, which resolved to ensure that quality, relevant, timely, open, and disaggregated data are made available and accessible to all users. It also called for the establishment of an innovative funding mechanism for strengthening the national data and statistical systems for the 2030 Agenda for Sustainable Development. Despite the excitement for the SDGs and the data revolution, investments for statistics development, whether from domestic sources or development partners, has not kept pace. And with the way financing is often allocated, it often leads to sub-optimal outcomes. Clearly, NSOs will still exist in 2030 and beyond, but like every organization in the emerging landscape, their future mandates will change. Statistical capacities will need constant improvement, especially in harnessing skills, technology for data capture and analysis, as well as in integrating traditional data sources with innovative data sources. Governments and development partners will need to invest in statistics, statisticians, and statistics offices. These investments require absorptive capacities of NSOs and other data producers, whose staff will need future skills so that they can obtain insights from traditional and innovative data sources that decision makers can use in real time in improving development outcomes today for a better and brighter tomorrow for real people in every corner of the world. A. Martinez. 2018. Big Data Can Transform SDG Performance. Here’s How. Asian Development Blog. 21 June. CNN. 2000. The Blair Tech Project. 28 January. Devex. 2018. At UN World Data Forum, a Focus on Data Capacity. 22 October. Independent Evaluation Group. 2018. Data for Development: An Evaluation of World Bank Support for Data and Statistical Capacity. World Bank Group: Washington, D.C.
J. New. 2018. Why Do People Still Think Data Is the New Oil? Center for Data Innovation. Commentary. 16 January. N. Risse. 2018. Experts Provide Guidance on Data Interoperability for SDGs. IISD—SDG Knowledge Hub. 25 October. Open Data Watch. 2016. Open Data to Support Sustainable Development Goals. Paris 21. 2016. PRESS 2016: Support to Statistics Remains low, putting SDG Monitoring at Risk. Partner Report on Support to Statistics (PRESS). United Nations. 2018. World Data Forum Wraps Up with a Declaration to Boost Financing for Data and Statistics. News. 24 October. United Nations. 2013. A New Global Partnership: Eradicate Poverty and Transform Economies through Sustainable Development. The Report of the High-Level Panel of Eminent Persons on the Post-2015 Development Agenda. New York. United Nations Statistics Division. 2017. The Sustainable Development Goals Report 2017: Harnessing the Power of Data for Sustainable Development. We Are Social. Global Digital Report 2018. World Economic Forum. Fourth Industrial Revolution. Jose Ramon Albert was Chief Statistician of the Philippines. He has worked in 25 countries providing capacity development assistance on data analytics, including the analysis of poverty and income distribution. He has written widely on development issues, including big data, emerging technologies, education, and social protection. Art Martinez works on SDG indicator compilation, particularly poverty statistics and big data analytics. Prior to joining ADB, he was a research fellow at the University of Queensland where he also got his doctorate in Social Statistics.